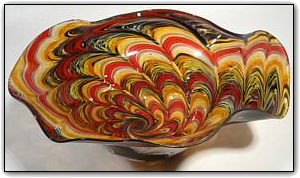 This lightly fluted table bowl features a bold and striking color combination of deeps reds, yellows, blacks, whites, and several colors in between. Working with canes is a two stage time consuming process, first Dirwood hand pulled the canes used to make this bowl then he made this bowl using those brightly colored canes. Make sure to zoom in to see just how vivid the colors are and how they interact with each other to create such out of this world patterns... so amazing!